Several policemen were killed on October 21, 1959 at Hot Springs in Ladakh by the Chinese troops. After that incident, October 21 is observed as the Police Commemoration Day every year in memory of the slain policemen. 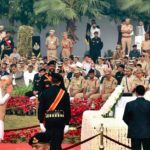 Since Independence, about 34,844 police personnel have died on the line of duty, with 424 having lost their lives this year. 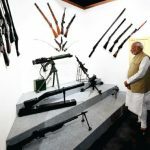 Many of these brave lives were lost in the fight against terrorism in various geographical regions such as Kashmir, Punjab, Assam, Nagaland, Manipur, Mizoram and LWE-affected regions of the country. A large number of police lives were lost in prevention of crime and in maintenance of law & order. 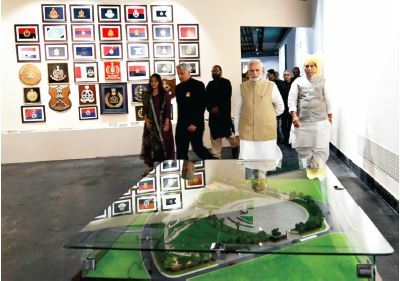 The National Police Memorial erected on 6.12 acres of land in Chanakyapuri, New Delhi was inaugurated by the Prime Minister- Narendra Modi on Police Commemoration Day this year. 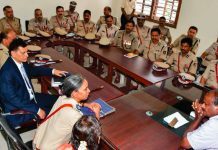 It has been created to recognize the sacrifices of police personnel since independence. 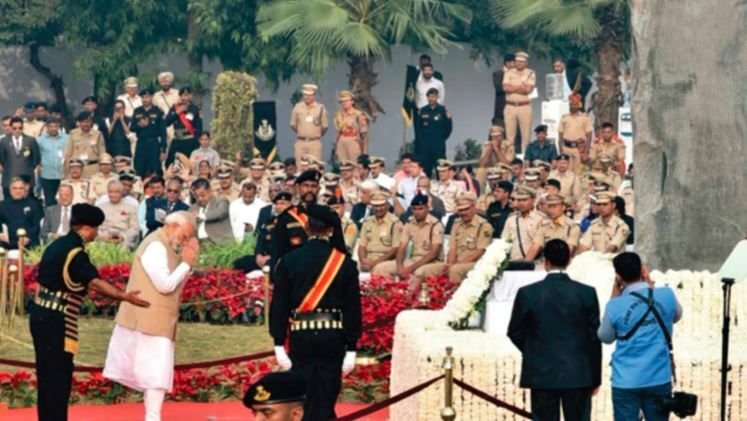 On this occasion, the prime minister also announced an annual award for police personnel who display exemplary service during rescue operations. 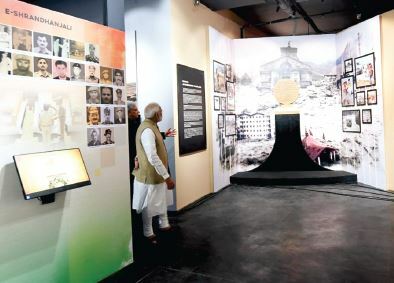 The award is named after Netaji Subhash Chandra Bose. 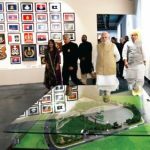 In his address, to a gathering of serving and retired police personnel the PM said, “The memorial could have been constructed much earlier if the earlier governments had taken the initiative. With their alertness, the police forces have managed to ward off disruptive elements who create unrest. 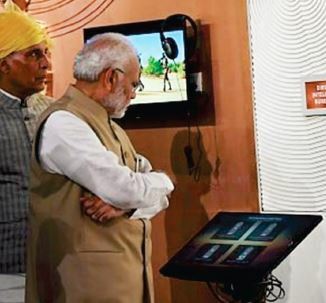 The attempts to create fear and insecurity in the nation were foiled by you. The peace prevalent in the nation is possible only due to your services. This is a day to remember the jawans who maintain law & peace in Jammu & Kashmir and fight against terrorism. The jawans on duty in the naxal affected areas are doing a great service. 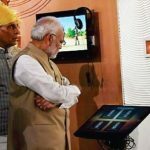 Due to their unrelenting efforts, the number of naxal affected districts have dropped down and the youth are able to participate in the mainstream. 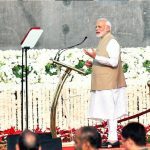 The Prime Minister was choked with emotion during his address and expressed his gratitude towards the police personnel, paramilitary forces and the National Disaster Relief Forces(NDRF) for their work. The police and the paramilitary forces are supported by other people too during a disaster. They are however not accorded due recognition. 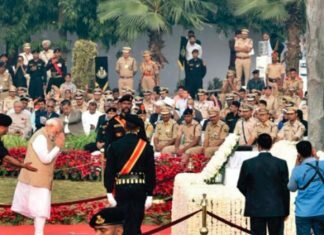 And, so the prime minister dedicated the Police Commemoration Day to the disaster relief forces as well. 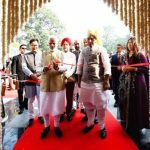 He also remembered the forces deputed in Jammu and Kashmir and naxal affected areas. 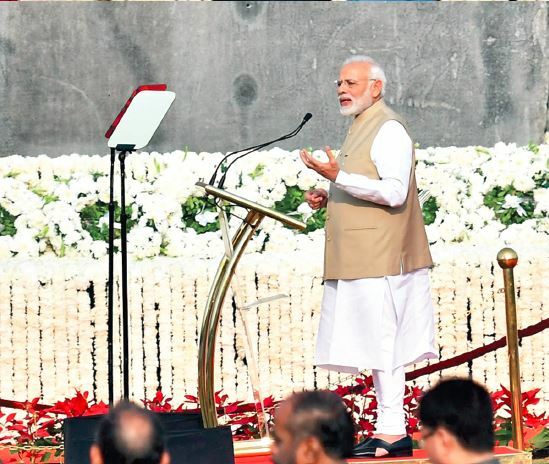 “Today, more youth from these tension- prone areas are getting connected with the mainstream due to the commendable work of the deployed security forces. The forces play a crucial role in the development of the Northeast states,” he said. The Police Memorial represents all State/UT Police Forces and Central Police Organisations of the country. 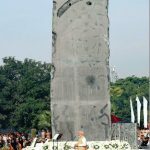 The central sculpture of the memorial is a 30 feet monolith made up of a single piece of granite, weighing 238 tons. It’s weight and colors symbolize the gravitas and solemnity of the supreme sacrifice. A 60 feet long river at the base of the sculpture reflects the continuous self-service of the policemen and women, to maintain peace and public order. 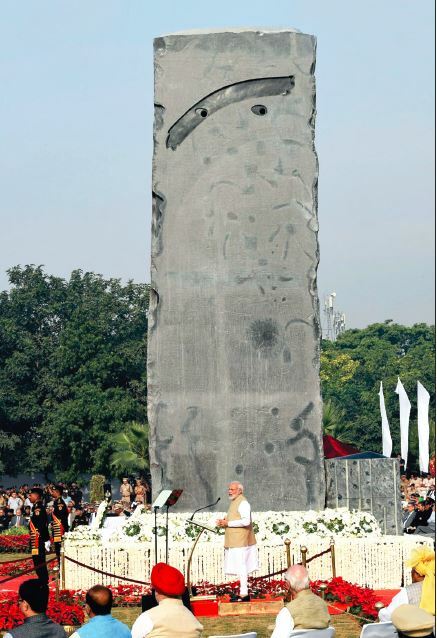 The Wall of Valour has the names of all 34,844 martyrs engraved on granite. 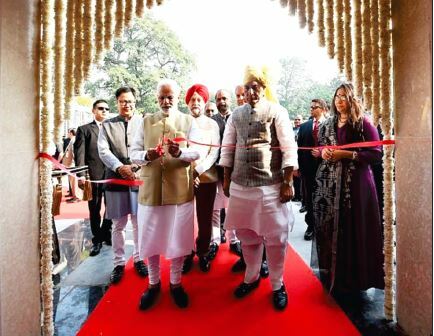 It has been built on a 6.12-acre land in Central Delhi’s Chanakyapuri area at the northern end of Shanti Path. The memorial, built a few years ago, has now been refurbished and the central structure has been enhanced by replacing the old rock structure. 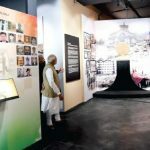 The museum capturing the history, artifacts, uniform and gears of central and state police forces is an underground facility in the premises of the national police memorial. It has five galleries over 1600 square meters. 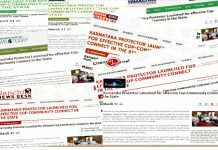 There are sections dedicated for various central and state police forces in India including Central Industrial Security Force, Special Protection Group, National Security Guard, Rapid Protection Force, Bureau of Civil Aviation Security, Central Reserve Police Force and Intelligence Bureau. Police Forces from all 29 states and seven Union territories are represented. Women squads have been adequately presented. Police bands and animal squads (camel, dog & pigeon post) have been specially mentioned. The role of Bureau of Police Research & Development, the National Institute of Criminology & Forensic Science and National Technical Research Organization have been highlighted at the museum. 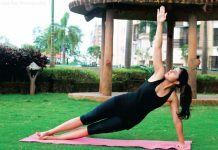 Why You’re Losing Weight But Not Belly Fat – And What To Do About It?